"Una! Hurry up and stop pawing through that old junk!" The voice of an impatient Mutant Kyrii thundered across the hub of Neopia Central, but UnaRae merely smiled to herself and continued to paw through the piles of donations. Her shining fins glistened in the sunshine, and were the colour of creamy yellow butter. A slight breeze ruffled her dorsal fin, but the young Koi continued to root around in the donations. Una picked up a mint jelly and tossed it into her basket. She grabbed two healing potions, and added them as well. Perhaps Zadar didn't realise that free items were helpful, she thought, as she looked over some other items. What Una didn't know was that something wonderful was about to happen, and it was going to be one of the most memorable events in all her life, as well as the lives of her three brothers, who stood a few yards away, waiting for her to return from her search for goodies at the Money Tree. All of a sudden, the wind picked up speed, and suddenly, without any warning, there was a cloud of mist in front of Una. The mist was a mixture of soft pastel colours, all swirled together, and it was very beautiful. Una stepped back in surprise, and then, before her very eyes, from within the rainbowy mists, the faerie emerged. Una had seen plenty of faeries in her time, but never before had a faerie appeared in a cloud of pastel coloured smoke. 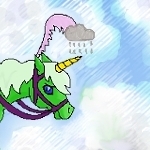 There was only one faerie in all of Neopia who could appear in such a cloud like this, the Fountain Faerie. Una realised that something wonderful was about to happen, and she began to tremble a bit in excitement. The Fountain Faerie's quests were the rarest of all, and the most sought after, as well. "Greetings, young Neopet. I have a task for you," said the faerie in her clear, silvery voice. "I'm in need of this plushie. Bring it to me and you shall be rewarded handsomely." With another warm smile, the Fountain Faerie disappeared, leaving the young Koi trembling like a leaf on a tree branch. No way could this be happening, she thought to herself. At this moment, CaturbulanceZadar came over to his sister, his patience worn out. He was not known for being patient. Behind him, looking on with mild amusement, were Ccaenine and Ollie. Ollie, only recently adopted into the family, looked at his brother with mild speculation, then turned to Ccaenine and whispered to the Blumaroo. Ccaenine nodded and rolled his eyes. Ollie chuckled, and his amber eyes twinkled in amusement. He was only just getting acquainted with Zadar's level of patience. "Una! Hey there! Come on, we're waiting!" Zadar tugged at Una's fin, then scowled as he realised she wasn't budging. He waved a clawed paw in front of her face, and Una finally blinked her eyes and looked up at Zadar. She smiled into his eyes. "Zadar," she said quietly, "we need to get over to the Neopian Bank. We've an errand to run. No time to explain, just get the others and meet me at the Neopian Bank." Una took off, and Zadar frowned, but went to get the others, just the same. They met Una at the Neopian Bank, then she hurried them all to catch the ferry that led to Mystery Island. During the ride, Zadar turned to his sister, more frustrated than ever. Something was up, or why would they be on their way to Mystery Island? Zadar smelled a Miamouse, but Una gave nothing away.They got off and went in the direction of the Trading Post. Here, Zadar called them all to a halt. "Ok, fess up, Una! What in Neopia is going on? What's this all about?" The Mutant Kyrii tugged at an ear, something he did when he was feeling puzzled. Una gulped, then looked at him, her eyes shining in excitement. "Zadar, like it or not, we're on a Fountain Faerie quest, so that's why we came here. I need to buy a plushie for the Fountain Faerie." Una smiled up into the grumpy face of her brother, who merely stared at her. "A Fountain Faerie quest?" He looked at her in disbelief, his eyes wide with shock. Zadar looked so amazed, Una thought his jaw might fall onto the ground. "Una, are you serious? Did you really see the Fountain Faerie?" She nodded, and Zadar let out a whoop for joy. "Awesome! This is great! Go buy the plushie, then!" The huge Kyrii did a little dance, then calmed down and went over to Ccaenine and Ollie were sitting under a tree. He scooped up the baby Blumaroo and hugged him, then he grabbed the puzzled Ogrin and hugged him as well. Ollie glared at Zadar. "Well, a bit over Kreludor, are we?" Ollie said crisply, smoothing down his dark purple ruff. Zadar explained the situation as calmly as he could, and once he had finished, even Ollie seemed excited. "Look, I don't think it's any of my business, but perhaps we should give the reward to Una, since she's going to such efforts to complete the task," Ollie said, after a moment. Zadar nodded, and so did Ccaenine. Una rejoined them later on, a wrapped parcel in her marketing basket. They went home for a quick dinner, then they all went to Faerieland. Una stepped forward slowly, once they had come to the right place, and took the parcel out of the basket. The Fountain Faerie appeared in her rainbow cloud, and smiled at the family, all of whom were wide-eyed in amazement. Una unwrapped the parcel, and the Fountain Faerie smiled in approval. "You've completed your task, now for a reward." She smiled and vanished. Una knew what this meant. She hurried to the Rainbow Fountain, the others right behind her. Now, for the very first time, she could see the true power of the Rainbow Fountain. She looked at the beautiful cascade of magical Rainbow Water, and at the good Fountain Faerie, smiling and serene. She nodded, and Una nodded back, then turned to the others. "It's the opportunity of a lifetime," she said, tears of joy in her eyes. Zadar hugged her, and then Una dashed forward, thought of a colour, and dove into the pool. When she came out, Zadar chuckled in amusement, his eyes dancing in his face. Ollie merely shrugged, but Ccaenine looked at Una in amazement. "Of all colours, why did you go with Pirate?" Ccaenine asked, looking baffled. Una grinned, then turned to the Fountain Faerie, and waved her hat at her, and turned back to the others, whistling beneath her breath. "A pirate's life for me, beneath the deep blue sea, with cheese crumpets and tea!" Una sang out in her sweet voice, and her eyes twinkled at her three brothers. "And ye thought I'd be choosing a nicer colour than this? I'm a Koi, ye know! A bit of adventure for me, I say! Ahoy, mateys! Home we go!" Zadar groaned in dismay, and clapped a paw to his brow. Of course, things would be different, with a Pirate Koi in the house. "Uh, Zadar, do you think she'll be stealing our toys?" Ccaenine whispered, glancing at Una with a nervous little smile. Zadar shrugged. Who could say for sure? However, he reflected as they went inside their home, life was going to be a bit more colourful, from then on.